Family holidays in Cancun can be perfect and in my opinion are best suited to families with older children. 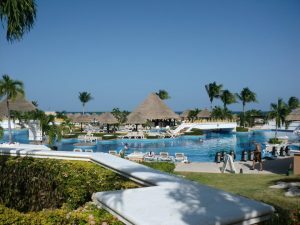 The superb all inclusive hotels in Cancun can be great for a family holiday, not just the unlimited food and drink but also the entertainment and sports facilities. Apart from that, there are some great expectations the memory of which will last forever. Xcaret eco park near Playa del Carmen is an amazing mix of animals, water fun and Mayan culture. Swimming with dolphins is also a firm favourite with families who holiday in Cancun. 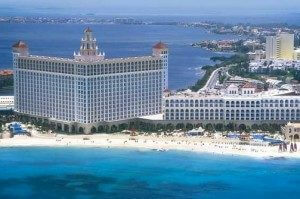 Riu Cancun Hotel is a great choice for a Cancun holiday. One of the iconic Cancun hotels and famous for offering optic spirit dispensers in every room, The RIU Cancun is in a central location on the Cancun hotel zone close to all the action and on a nice beach with views out to Isla Mujeres. The public areas and gardens are very well maintained as are the pools, beach and rooms. The RIU Cancun is exclusive to Thomson for UK customers. 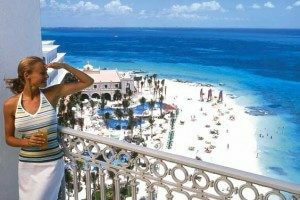 All rooms at the Riu Cancun Hotel have a sea view. You can request a high floor at the time of booking. The all inclusive programme at the RIU Cancun is available 24 hours with the sports bar open 24/7 for snacks and drinks. For A la Carte dining there are two waiter service restaurants – Kawachi, the Japanese and Rodizio, the Brazilian. The buffets in the main restaurant “Don Juan” are superb with show cooking and theme nights, there is an additional buffet option for dinner at the poolside “La Mision”. In addition to the in room optics you’ll also find the mini-bar is kept well stocked. 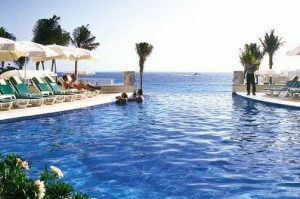 There’s 3 swimming pools at The RIU Cancun, 1 of which features a swim up bar. There’s also a jacuzzi and poolside bar. Another great choice is The Moon Palace Golf & Spa Resort Hotel is an ever popular Cancun holiday choice especially for honeymoon and anniversary couples. 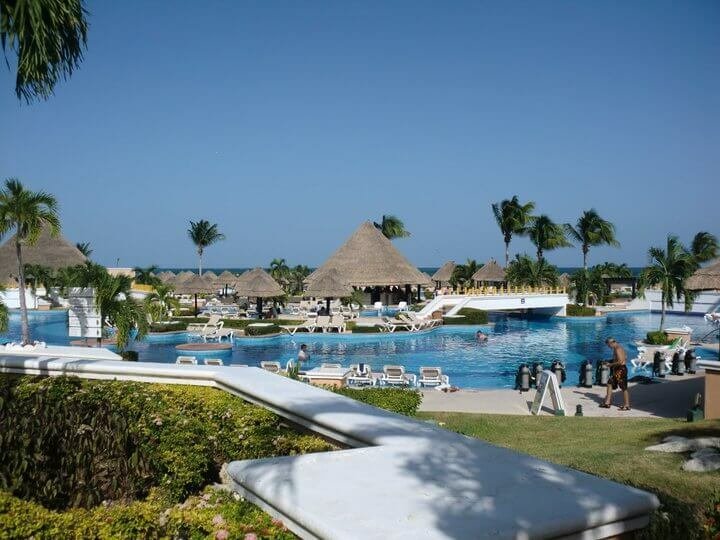 A huge resort, with over 2000 rooms, the Moon Palace is only a 10 to 15 minute transfer from Cancun airport. With 15 restaurants to go at, as well as 24 hour room service available you’ll be able to work up an appetite in Cancun’s largest swimming pool, or by playing tennis or golf on the Jack Nicklaus course. All guest rooms at the Moon Palace Golf & Spa Resort Hotel feature a whirlpool bath, optics and mini-bar included in the all inclusive. There is also room service available 24 hours a day. Wi-fi is also free of charge. The spa at the Moon Palace includes three couples treatment rooms which might suit honeymooners. There’s a total of 30 treatment rooms offering all the latest therapies and massage treatments including reflexology and accupressure plus sports treatments to relax and restore muscles. The flight time from UK airports to Cancun (CUN) is around 11 hours. The good news is that the new airport means getting through customs / passport control is fairly efficient and also that the transfers from the airport are fairly short whether you are going to stay in Cancun or Playa del Carmen. The longest transfers are to the hotels on The Riviera Maya such as The Akumal Beach Resort. There are no scheduled flights to Cancun direct from the UK so apart from charter seat only, other options are normally via the USA, for example via New York or Miami but that turns the journey into a much longer and complicated affair so most people stick to the charter flights. Both Thomson Airways (which incorporates Thomsonfly and First Choice Airlines) and Thomas Cook Airlines (which incorporates MyTravel Airways and Thomas Cook) are increasing the seat pitch on their longhaul aircraft as well as improving facilities to include for example individual seat back TV screens. Thomson Airways was the European launch customer of the Boeing 787 which has set new standards for in flight comfort with large windows and improved air quality and cabin lighting.